The SCREENPLAY Development Centre has been created because of a simple need -- the need to find commercially-viable screenplays. Australia's film industry has one ongoing fundamental problem -- the lack of development funding for commercial projects. Put simply, the production companies are competing in a global marketplace, but without internationally-competitive financial backing. This leaves our production companies in a difficult position. Unable to fund as much development as they'd like, they must search for market-ready screenplays. As we have discovered in our attempts to build a Screenplay Development Centre, most of the screenwriting education in Australia comes from schools and universities. The problem here is that the craft is not taught by those with firsthand industry experience, but rather by teachers who are teaching a curriculum. This leads to the old problem of the blind leading the blind. Booksmarts will only take you so far. A craft takes time and energy to master, and one read of even the very best screenwriting books doesn't mean you can apply it. The screenplay is the very foundation of a movie -- a movie's success is dependent upon a solid screenplay. It's simply too important to leave to chance. Yet, those who teach the craft often have no firsthand experience with the how's and why's of screenwriting. They teach what they've been taught -- and not from a position of knowledge. We're attempting to build a new system. One that appreciates the limited resources of our industry, and the high costs involved in actually making films. To write without the market in mind is to waste money. So we've gathered a team of professionals, to teach and coach and work with emerging screenwriters. Our professionals have hands-on experience in the film industry, both in Australia and overseas. 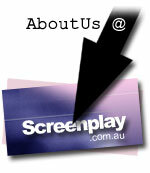 We're creating the SCREENPLAY Development Centre to be the central place for screenwriting in Australia. Where writers of all levels can come to learn, to grow, to master, and to sell. Because by generating a steady stream of commercially-viable screenplays, we will help the Australian film industry as a whole, making it more profitable and successful, which in turns leads to ever more opportunity. By creating a central screenplay submission centre and the Screenplay Notification Service, we're also saving the writer the costs of multiple submissions and negative Coverage -- while simultaneously saving the production companies the costs of redundant reader services. A Quick History of Screenplay.com.au looks like this. In early 2000, Jeff Bollow was in post-production on the independent feature film "6,000 Miles from Hollywood", when he began looking for screenplays to develop follow-up feature projects. Frustrated at the quality of the several dozens scripts he saw, Jeff decided to offer screenwriting workshops through his company, Embryo Films. The initial goal was to find a group of emerging writers, who he could train and develop to ultimately write screenplays Embryo Films could produce. Jeff's aim was to help writers avoid the mistakes he made and lessons he learned through the hands-on process of making "6,000 Miles", and to develop a rapport with serious emerging writers. As Jeff soon discovered, however, people with the time, energy, talent and focus required to write a successful screenplay were difficult to find. So, over the next two years, Embryo Films offered nearly 40 workshops in 6 cities, with fully 100% of participants recommending Jeff's workshops. But the workload became too great for Jeff, and he found he was not focusing enough time on getting film projects ready, as his entire focus was devoted to finding and developing screenwriters. The sad statistic he discovered was that more than 95% of submitted screenplays failed to achieve their objectives. But even worse than that, fewer than 5% of new screenwriters would continue to hone and develop and expand their craft. In short, there is a shortage of feature screenwriters. This led to the creation of the SCREENPLAY Development Centre in June 2002. After registering the Screenplay.com.au domain name, Jeff began searching for suitable teachers and coaches to expand his team. As the shortage of screenwriters in Australia is a problem for more than just Embryo Films, the SCREENPLAY Development Centre has been established to be independent of all production companies, whilst working on their behalf. Jeff operates from the simple belief that "If you build it, they will come". As a result, the SCREENPLAY Development Centre is being built from the ground up.